Do cranberries really lower blood sugar? Home / Health A-Z / Do cranberries actually lower blood sugar and prevent diabetes? 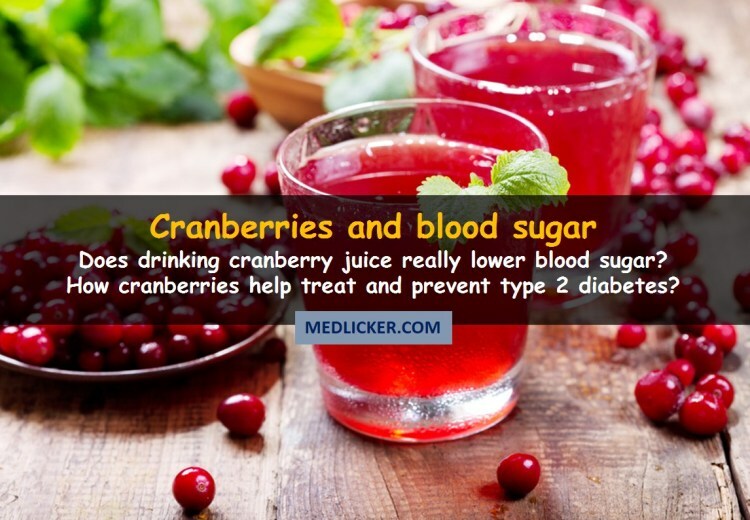 How do cranberries affect blood sugar and diabetes? Should you drink cranberry juice for better blood sugar control? Other measures to lower blood sugar and improve insulin sensitivity? Cranberries (fruits of the plant called Vaccinium macrocarpon) are fruits from the berry family, along with blueberries, bilberries or cowberries (also called lingonberries). Fresh (natural) cranberries contain mostly water (90%), carbohydrates and both soluble and insoluble fiber (1, 2). Typical carbohydrates found in cranberries include simple carbs, such as fructose, glucose, and saccharose (also called sucrose) (3). They are also rich in vitamins and plant compounds, which makes them very beneficial to your health. Cranberries are particularly high in vitamins C, E and K1 (phylloquinone). While vitamins C and E are strong antioxidants, which help your body fight free radicals and prevent some serious diseases, including cancer, vitamin K1 is necessary for blood clotting. Cranberries are also an excellent source of manganese and copper. Manganese is a mineral, which improves metabolism and promotes cellular growth. It is also an essential molecule for the body’s antioxidant system. Copper is necessary for a healthy heart (4). Quercetin: cranberries are one of the richest natural sources of quercetin, a polyphenolic antioxidant, which helps prevent inflammation (by inhibiting cyclooxygenases) and cancer cell growth (8, 9). Ursolic acid: peel of cranberries is a rich source of this acid, which has potent anti-inflammatory properties. Same as peonidin, this molecule may be beneficial in treatment and prevention of some kinds of cancer (10, 11). Myricetin: this plant compound is a powerful polyphenolic antioxidant, which has some strong anti-inflammatory and anticancer effects (12). Most of these plant compounds are found in cranberry peel, which means that the best source of them are natural (fresh) cranberries. Cranberry juice or cranberry extracts are processed and are much lower in these beneficial molecules. The summary: Cranberries are rich invitamins, minerals and plant compounds, which may fight and prevent many serious diseases, including cancer and diabetes. Diabetes is a disease characterized by either lack of insulin or insufficient response of cells to insulin (so called insulin resistance). Insulin is a hormone responsible for the absorption of glucose from the gut into cells, which use it as "fuel" or a source of energy. If pancreatic cells do not produce a sufficient amount of insulin, we cannot digest all carbs from food quickly enough, and the excess of glucose gets into the blood, causing hyperglycemia (excessive blood sugar level) and type 1 diabetes. Type 1 diabetes usually occurs when an autoimmune reaction destroys insulin producing pancreatic cells. The treatment of this disease consists of regular administration of insulin. People with type 1 diabetes may not be overweight or obese. Family history (genetics), pancreatic diseases and some inflammatory conditions also contribute to the development of type 1 diabetes. If your pancreas produces enough insulin but the cells of your body do not respond to it (insulin resistance), type 2 diabetes develops. This disease mostly occurs in adults, but you may develop it at any age. Type 2 diabetes is a widespread disease. From 1980 to 2014 the number of people who have type 2 diabetes has risen almost three times (13). The main risk factors for developing type 2 diabetes are obesity, insulin resistance, sedentary lifestyle, polycystic ovary syndrome (PCOS), older age (45+), ethnic background and gestational diabetes. If you are an Afro-American, Asian or Latino, you are at higher risk of getting type 2 diabetes. The same goes for gestational diabetes (diabetes in pregnancy). If you developed gestational diabetes, you have a greater chance of getting type 2 diabetes later in life. Type 2 diabetes develops gradually. At first, your cells become insulin resistant, and blood glucose regulation slowly deteriorates. This stage is called prediabetes or impaired glucose tolerance. It is usually possible to reverse prediabetes and restore normal glucose tolerance. You need to change your lifestyle, and your doctor may prescribe you the medication, called oral hypoglycemic agents or oral antihyperglycemic agents. When type 2 diabetes fully develops, you need to take insulin and other medication to lower your blood sugar and LDL cholesterol levels. The main reason why proper treatment of diabetes is necessary is to prevent the development of complications of diabetes, such as cardiovascular diseases, eye (retinopathy), kidney (nephropathy), nerve (neuropathy) and DKA (diabetic ketoacidosis). The summary: Diabetes occurs when your pancreatic cells do not produce any insulin or when your cells are insulin resistant. It is necessary to treat it properly to prevent the development of severe and life-threatening complications. Do cranberries lower blood sugar? Doctors have been studying the effects of cranberry juice on blood sugar levels (serum glucose) extensively. Diabetic patients are at a high risk of cardiovascular disorders and dyslipidemia (impaired blood lipid levels, which increase the chance of developing atherosclerosis and myocardial infarction). In one study on 58 patients with type 2 diabetes, participants were divided into two groups (14). One group of patients drank 1 cup of cranberry juice a day for 12 weeks. The other group drank placebo. The group of patients, who received cranberry juice, had a significantly lower blood glucose and a significantly higher serum apoA-1 activity than the placebo group. Apo A-1 is a marker of HDL (good) cholesterol. The higher the level of HDL cholesterol (and apoA-1) the lower the risk of cardiovascular diseases (15). Another study suggests that cranberry juice consumption lowers blood glucose concentrations in adults, as well as other markers of cardiometabolic risk, such as blood pressure, CRP (C-reactive protein) and triglycerides (16). Polyphenols (mainly proanthocyanidins) in cranberries also improve insulin sensitivity in non-diabetic, overweight or obese patients. A study on 116 "healthy" people aged 40 to 70 with insulin resistance and Body Mass Index (BMI) ≥ 25 kg/m2 showed that 300 mg of cranberry polyphenols (taken as cranberry juice or extract) a day for six weeks results in a significant improvement in blood insulin levels and insulin sensitivity (16a). Experts also studied the effects of cranberry powder on oxidative stress and glucose level control. In an animal study, mice receiving an atherogenic diet and LPS (lipopolysaccharides), were given cranberry powder in various amounts. 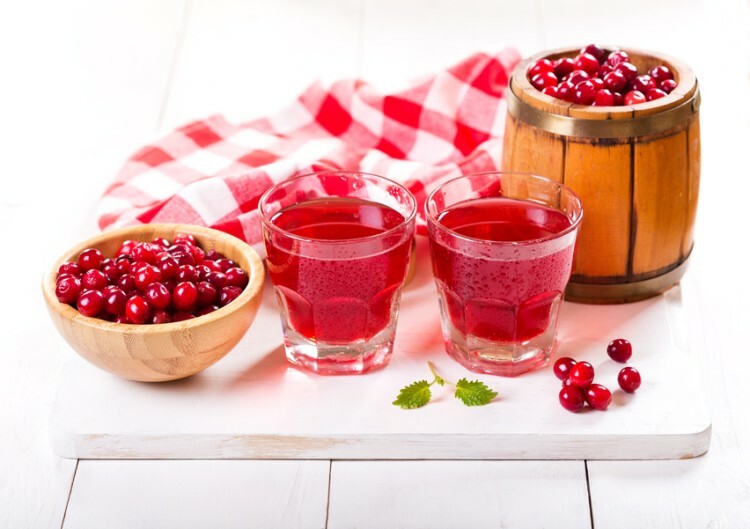 The results show that cranberry powder may decrease the oxidative stress by improving lipid profiles (mainly through an increase in HDL cholesterol levels), by lowering blood sugar levels (serum glucose) and increasing blood insulin levels, as well (17). Another, more recent study suggests that a combination treatment with metformin and vitamin C may relieve symptoms of type 2 diabetes (17a). This therapy significantly increased the insulin levels in blood and also decreased pro-inflammatory cytokine levels. However, this was an animal study, so it is necessary to verify whether the combination of metformin and vitamin C works in humans before making any suggestions or conclusions. Many human trials have been studying the effects of cranberry juice, extracts, and supplements on various risk factors for cardiovascular diseases. Cranberries are high in antioxidants, such as anthocyanins, quercetin, and proanthocyanidins, which may lower the possibility of heart diseases in both healthy individuals, as well as in people with type 2 diabetes (18, 19). Studies suggest, that cranberry juice increases the blood levels of HDL (good) cholesterol, lowers LDL (bad) cholesterol in diabetics, protects LDL-cholesterol from oxidation (this is important in prevention of atherosclerosis and myocardial infarction), reduces blood pressure and decrease the blood vessel inflammation by lowering homocysteine levels in blood (20, 21, 22, 23, 24, 25). However, not all studies have come to the same conclusions, and in general, evidence of cranberry efficiency for diabetes and blood glucose control is considered to be weak (26). That said, it seems that cranberries (taken as cranberry juice or extract) may lower blood sugar levels and reduce some risk factors for cardiovascular diseases, such as dyslipidemia. The summary: Polyphenols in cranberries may reduce blood sugar, improve insulin sensitivity, decrease blood pressure, LDL cholesterol and other risk factors for cardiovascular diseases. However, more studies are necessary before giving any advice to patients. Studies suggest that cranberries can lower blood sugar and positively influence risk factors for cardiovascular disease. For example, they reduce blood pressure and improve the lipid profile, helping to prevent myocardial infarction, stroke, and other illnesses. So, unless you suffer from kidney stones or allergy to cranberries, you may drink cranberry juice to take advantage of its blood sugar lowering properties and other health benefits. There is no recommended daily volume of cranberry juice for type 2 diabetics, but most studies suggest that two glasses (about 240 ml each) of cranberry juice a day is enough to reap all the benefits and avoid the side effects (27). In any case, you should never consume more than 1 liter of 100% cranberry juice a day as this significantly increases the risk of kidney stones. The summary: Cranberry juice may lower blood sugar, blood pressure, LDL cholesterol and decrease other risk factors for heart diseases. You may try to drink up to 2 glasses (240 ml each) a day to improve your blood glucose and insulin sensitivity. As a fruit, cranberries, look nice, but unfortunately, they have a sour taste, which makes it very difficult to eat them "raw." This is why most people consume cranberries as cranberry juice and extracts or buy cranberry diet supplements in a pharmacy. You should choose carefully as most of the polyphenol antioxidants that give cranberries their therapeutic effects are found in the skin, which is removed before juice production. This is why cranberry juice usually contains only a fraction of antioxidants and other beneficial molecules compared to fresh cranberries. Before purchasing any cranberry product, make sure to read the label and only buy proven organic products that contain the highest levels of antioxidants and active ingredients. Another problem with cranberries is the fact that they can contribute to the formation of kidney stones (especially so-called oxalate kidney stones). Cranberries increase the concentration of oxalates in the urine and additionally contain vitamin C, which in part also changes in the body to oxalates and enhances the risk of certain types of kidney stones (28, 29). Not all studies agree but to stay on the safe side, you should always consult your doctor about the long-term use of cranberry juice. The summary: Do not drink more than 1 liter of cranberry juice a day as it significantly increases the risk of kidney stones. 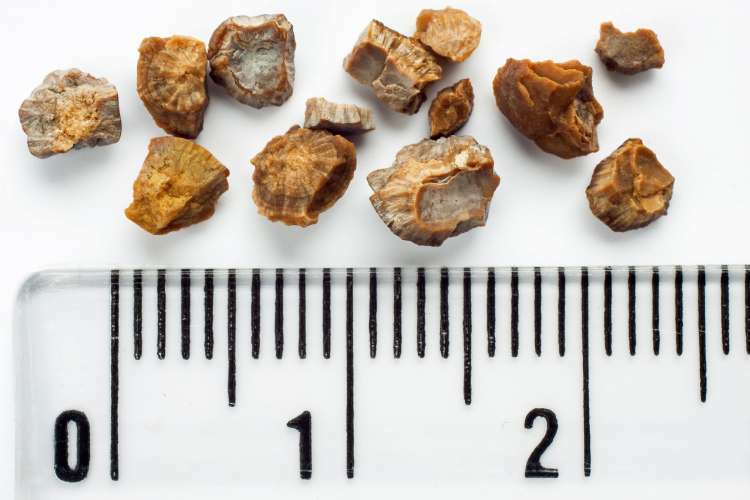 If you have (or had) a kidney stone before, you should not drink cranberry juice. Ask your doctor for advice. Before we begin, it is necessary to say that diabetes is a disease, which must be addressed by a doctor. Some food and beverages (including cranberries) may help you lower blood sugar and improve insulin sensitivity, but always as an addition to (and not a substitution for) proper medical treatment. If you have diabetes or if you experience symptoms such as sweating, fatigue, frequent urination, excessive thirst, etc., contact your doctor immediately. There is an extensive research in foods to prevent or improve diabetes. A study on obese children with insulin resistance found that a low-glycemic index (GI) diet improves insulin sensitivity by increasing insulin blood levels any by decreasing fasting plasma glucose (30). Berries (including cranberries, blueberries, strawberries, etc.) are one of the best low-glycemic foods. So make sure to add plenty of them into your diet if you want to lower insulin resistance and achieve a better blood sugar level control. Another diet, which may help prevent diabetes, is the DASH (Dietary Approaches to Stop Hypertension) diet (31). This diet consists of foods, containing active compounds, which lower blood pressure, improve lipid profiles, insulin sensitivity, and blood glucose level control. Foods to eat are vegetables, fruits, whole grains, poultry, fish, and nuts. Foods to avoid are red meat sweets and sugar containing beverages. In general DASH diet is rich in fiber and essential minerals (potassium, magnesium, and calcium) and poor in harmful saturated fats. Insulin resistance and type 2 diabetes are often associated with obesity. Overweight people have a lot of visceral fat that is metabolically active and exacerbates lipid profile, insulin resistance, and other risk factors for cardiovascular and metabolic disease. Exercise and physical training improve insulin sensitivity and help lower blood glucose levels in both healthy individuals and people with type 2 diabetes (32). Therefore make sure you get enough exercise to prevent type 2 diabetes and improve your insulin sensitivity. The summary: In addition to cranberry juice, you should also eat other foods, which improve insulin sensitivity and lower blood glucose. These include fruits and vegetables, nuts, poultry and whole grain. Other lifestyle changes to reduce insulin resistance include exercise and physical training. Cranberries have a variety of therapeutic effects and are used not only for UTIs (urinary tract infections) but also in prevention of diabetes, high blood pressure, myocardial infarction, stroke or helicobacter pylori infections. Some studies suggest that cranberry juice reduces blood sugar and may be a good drink to mitigate the risk of diabetes and reduce insulin resistance, which is one of the leading causes of diabetes. Some experts recommend drinking two glasses of cranberry juice a day (about 480 ml) to prevent diabetes. Never drink more than 1 liter of cranberry juice daily because of the risk of kidney stones. If you have or had kidney stones, do not drink cranberry juice without a prior consent of your doctor. This article is evidence-based. Click the numbered references in it for more information.